A miniature military space shuttle that circled the world for 224 days on a shakedown cruise in 2010 rocketed back into orbit Tuesday to demonstrate the reusability of the X-37B spaceplane. Mounted atop the United Launch Alliance Atlas 5 booster, the shuttle was tucked inside the voluminous nose cone and simply along for the ride as it left Cape Canaveral's Complex 41 on a flight whose objectives and duration are not public knowledge. "As the X-37B program is examining the affordability and reusability of space vehicles, validation through testing is vital to the process. We are excited to see how this vehicle performs on a second flight," said Lt. Col. Tom McIntyre, X-37B program manager for the Air Force Rapid Capabilities Office. Standing 196 feet tall and weighing 757,380 pounds at launch, the Atlas 5 headed eastward off the pad at 1:03 p.m. EST (1803 GMT), exactly as planned despite a bleak weather forecast. The dual-nozzle RD-180 main engine gulped kerosene fuel and liquid oxygen to generate nearly a million pounds of thrust that shook Florida's Space Coast during the mid-day departure. Less than four minutes into the ascent, Atlas crossed the threshold to space and jettisoned its payload shroud to uncover the mysterious X-37B that had been hidden from sight throughout the entire pre-launch preparation process. 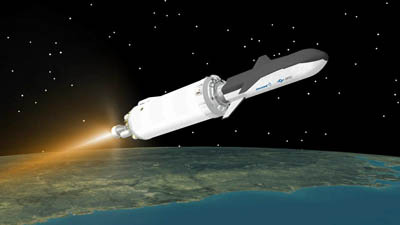 The first stage finished its burn four-and-a-half minutes after liftoff, separating away to reveal the RL10 engine on the Centaur upper stage. The launch had been delayed a-month-and-a-half to examine the low-thrust condition experienced by a similar powerplant of a Delta 4 rocket. The Centaur appeared to function flawlessly, firing for 13 minutes to heave the winged cargo into the desired low-Earth-orbit around the planet, although the actual altitude target was kept quiet. Just minutes later, the separated payload and bright rocket body, flying in formation, passed within view of a respected skywatcher in South Africa who spotted the newest objects orbiting Earth. "What a fantastic sight!" Greg Roberts exclaimed. "Absolutely beautiful! Now people might understand why I am so daft and mad about satellites -- it is moments like this that make it so rewarding!" Roberts and others correspond on the Internet about their hobby of tracking all sorts of satellites, keeping highly precise information about spacecraft orbits. ULA and Air Force officials hailed Tuesday's launch as a success, beginning the third mission for the X-37B program and the second for this particular spaceplane that had flown the maiden voyage from April through December 2010. 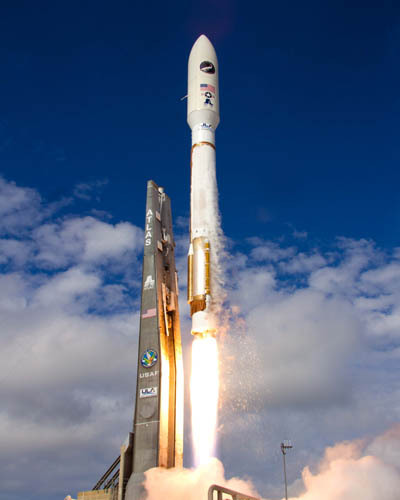 "This mission will incorporate the lessons learned during the refurbishment process on OTV-1," McIntyre said. A second vehicle spent 469 days in orbit from March 2011 until this past June. "We couldn't be more pleased with the strides we've made in this program and the success of the X-37B vehicle on the first two flights," said Richard McKinney, deputy under secretary of the Air Force for space. "However, it is important to keep in mind that this is an experimental vehicle and a third mission is still relatively young for a test program. This is the first re-flight of a vehicle so that is certainly a key objective for us. We have only just begun what is a very systematic checkout of the system." One-quarter the size of NASA's now-retired space shuttle, the unmanned X-37B conducts its mission and then autonomously returns to Earth, braking from orbit, plunging through the atmosphere and gliding to a pinpoint touchdown on a conventional runway to be refurbished and reused. It harkens back to the civilian space shuttle era, taking payloads up and down, and flying the same orbital trucks over and over again. While the first two X-37B missions touched down at Vandenberg Air Force Base in California, the Air Force acknowledges it is looking at the potential of landing this latest flight at the Kennedy Space Center in Florida. "We're seeking to leverage previous space shuttle investments and are investigating the possibility of using the former shuttle infrastructure for X-37B OTV landing operations, potentially as early as for the landing of OTV 3. Those investigations are in an early state, and any specifics will not be known for some time," the spokesperson said this autumn. That infrastructure includes the former space shuttle hangars, known as Orbiter Processing Facility bays, where the ships underwent post-flight deservicing and were readied for the next mission. Boeing has taken OPF bay 3 for use in preparing its commercial crew capsules for launches, but the interconnected OPF bays 1 and 2 are available for a customer like the Air Force. When this spaceplane will be coming back, however, is not known. "As with many other advanced technology test programs, some details of the mission and test requirements are classified or sensitive. The focus of the program remains on vehicle capabilities and proving the utility and cost effectiveness of a reusable spacecraft," an Air Force spokesperson says about the X-37B flights. "One of the most promising aspects of the X-37B OTV is it enables us to examine a payload system or technology in the environment in which it will perform its mission and inspect them when we bring them back to Earth. Returning an experiment via the X-37B OTV enables detailed inspection and significantly better learning than can be achieved by remote telemetry alone. Experiments can then be modified and reflown, allowing us to mature technology faster," the Pentagon spokesperson added. 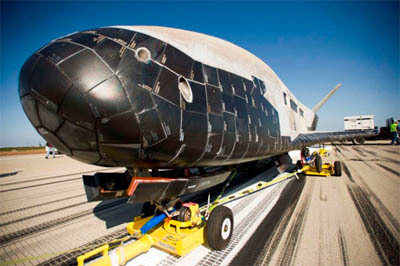 X-37B features a pickup truck-size cargo bay, seven feet long and four feet wide, that could be filled with equipment being exposed to the harsh environment of space for proof testing or could contain experimental instruments intended for use by future military and reconnaissance satellites. The craft's unique capability to drop from orbit and land on a runway allows technicians to get their hands on the hardware after it spent more than a year in space. Wild speculation about the spaceplanes and their missions has ranged from secret flyby surveillance of China's orbital station to the weaponization of space. 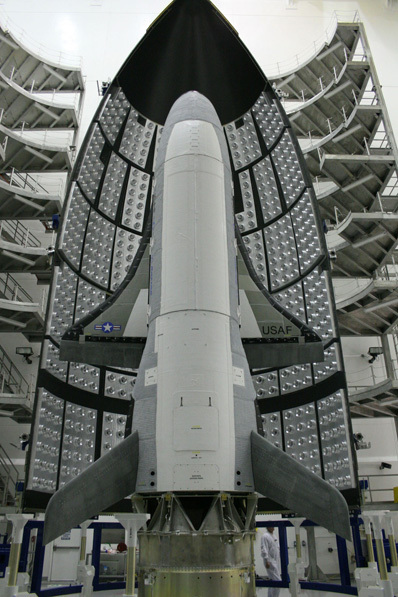 But the Air Force stresses that the X-37B is a test bed to carry experiments into space. "We want to be able to put an object up into space, materials and technology and so forth, test them out, bring them back and examine them," McKinney has said previously. "That's what it is, pure and simple." Built by Boeing's Phantom Works division, the spaceplane is 29 feet long with a wing span of 15 feet, made of light-weight composite structures instead of aluminum and shielded with improved leading-edge ceramic insulation panels on its wings and tougher silica tiles affixed to its belly that are designed to be more durable than first-generation tiles used on the space shuttle. It can weigh up to 11,000 pounds fueled for launch. The in-space design life is 270 days, but good performance on this past mission enabled ground controllers to keep it aloft significantly longer. 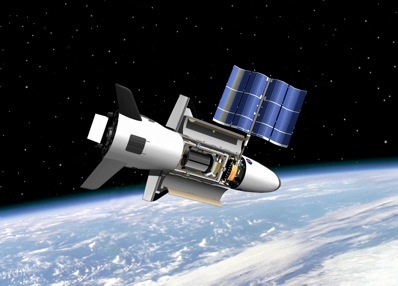 "The X-37B OTV is designed for an on-orbit duration of approximately 9 months," said McIntyre. "As with previous missions, actual duration will depend on the execution of test objectives, on-orbit vehicle performance and conditions at the landing site."